You have reached the right website if you are looking for pizza delivery in Hollywood, Florida. If you really want to enjoy something special, you should order your food from a restaurant that is operated by people who genuinely care. Pizza Machine is not an international chain that works with a corporate formula; we are a third generation family owned and operated business, and we have been serving people throughout Broward County for over a quarter of a century. Without question, Hollywood is one of the best places to live in the metropolitan area, with a perfect climate and easy access to anything you could ever want or need. We are proud to serve our neighbors in town, and we can get to you quickly if you are in Sunshine Park, Driftwood Acres, the Diplomat Parkway/Washington Street area or anywhere in between. To put it simply, for pizza delivery in Hollywood, FL Pizza Machine has no rival. There are many things that we do to prepare the best pizza in town, and as we have mentioned, the fact that we are family owned has a lot to do with it. We put a lot of love and care into our food, and you can taste it when you take your first bite. Plus, we go the extra mile when it comes to the quality of our ingredients. We use a blend of high grade mozzarella cheeses, and our sauce is made with carefully selected San Joaquin Valley tomatoes. Our toppings are also very carefully sourced, and we cook each and every pizza perfectly. Our Hollywood Florida pizza delivery service will always be available to you, but our offerings do not stop there. If you feel like something different, our menu includes delicious pasta dishes. The pasta that we use is imported from Italy, and you can choose either spaghetti, fettuccine, or penne. You also have freedom of choice when it comes to sauces, because you can select tomato sauce, pesto and basil, garlic and oil, meat sauce, or alfredo. To top it off, we offer meatballs, sausage, chicken, broccoli, spinach, and mushrooms. In addition to the pasta that we have on our menu, we also have other Italian entrees. 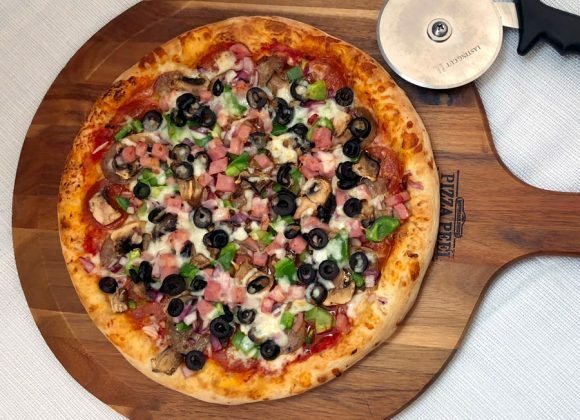 If you are ready for the best Italian food or delivery pizza in Hollywood, Florida, you can place your order online or call us at 954-437-3333.